I’m Ariel, new to the singer-songwriter scene, but long-time lover of music. I’ve been runnin’ around like a crazy person these days, getting myself into all sorts of projects! Got an EP Release coming up soon, but you can check out a preview of my songs (oh thank you iPhone recordings…) to the right. I’ll be releasing my first EP, Wanglicks, on April 21st at the Mayqueen house (1634 Fairview, Berkeley). It’s an early 7pm show opening with the beautiful melodies of Kasia Moon, followed by the soulful and playful Graham Patzner. 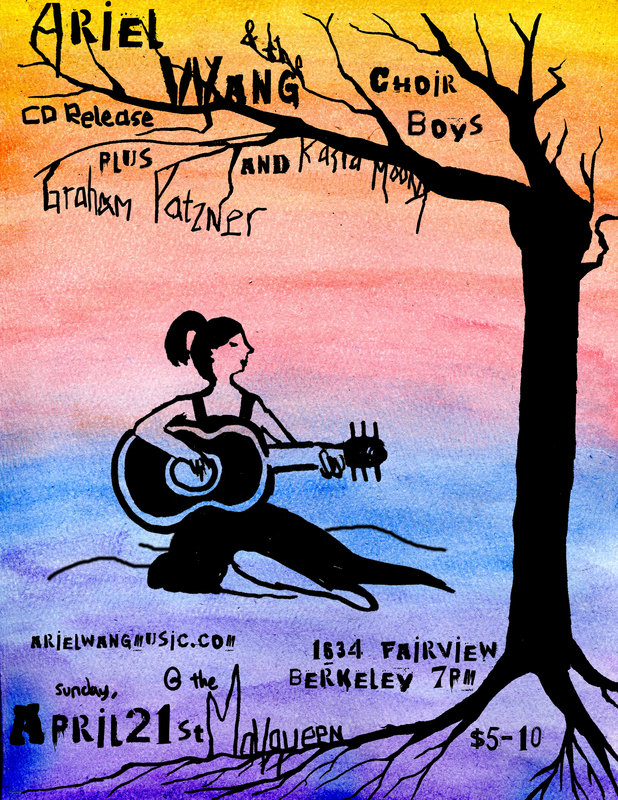 I’ll be finishing the night joined by the Choir Boys, featuring Harrison Murphy, Graham Patzner, and Terrell Liedstrand. It promises to be a beautiful night, so come have a drink with us! This entry was posted on April 1, 2013 by sakurakofournier. It was filed under Uncategorized .